This has to be one of the cutest 2-band radios designed in Japan prior to 1960. The design features that tickle me have to be the purple on mauve color scheme, the tuning dial that droops down at the right end, the curved "shoulders" on the cabinet, and most of all the telescopic antenna that rises from the radio's center. 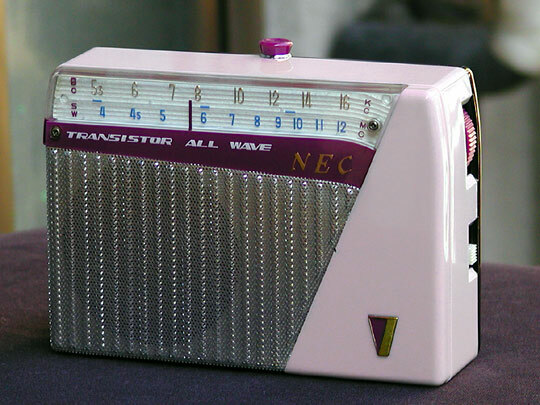 I also find it interesting that NEC boldly labels this AM/SW radio as a "TRANSISTOR ALL WAVE" model in the reverse painted panel below the tuning dial.